The observation of opiate binding in the substantia gelatinosa of the spinal cord, a region known to function in the modulation of sensory processing, and the observation that locally applied opiates would inhibit the discharge of nociceptive neurons, represents the substrate whereby animal and subsequent human investigations observed a powerful antinociceptive effect of spinally administered opiates. The superficially administered drugs must penetrate to the receptor sites lying within the spinal cord. Drugs which penetrate readily through lipid layers, will produce a more rapid onset and consequently will be more rapidly cleared. Drugs with low lipid-solubility will be characterized by a slow onset and a long duration of action. Polar agents will be less effective than lipid permeable agents following epidural administration. 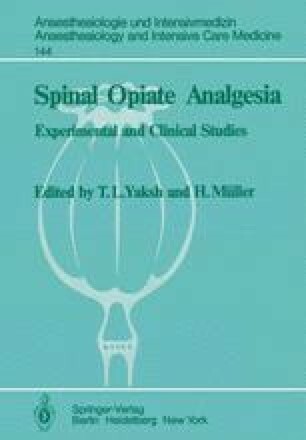 It is known that the actions of opiates on the spinal cord are more potent against those inputs which arise from C-fibers, and will be less effective against acute pain, i.e. that of cutting, or perhaps acute distension and as observed in final stages of delivery. The specific analgetic effects of spinal opiates are made less specific by diffusion to supraspinal sites mediating respiratory and cardiovascular activity. The ability of lipid soluble drugs to diffuse into the vasculature makes it likely that such agents will produce higher blood levels. As the effects of opiates are mediated by an action on specific membrane receptors, the properties of the spinal effects will be defined by this receptor interaction. Thus, the effect should be dose dependent and subject to a similar structure activity relationship as that seen following peripherial administration and antagonized by naloxone.